SANTA FE – A new fishing season is approaching fast, and the New Mexico Department of Game and Fish would like to remind anglers to purchase a 2018-19 fishing license. The fishing license year runs April 1 to March 31. Licenses can be purchased 24 hours a day on the department website, www.wildlife.state.nm.us, during business hours at department offices and license vendors statewide, or by calling the department Information Center, (888) 248-6866. For angler’s convenience, Information Center phone lines will be open from 8 a.m. to 1 p.m. Saturday, March 31 and Sunday, April 1, giving everyone a chance to purchase a license on or before opening day. Licenses purchased online or through the Information Center can be emailed, downloaded and printed. Because fishing licenses don’t have a tagging requirement, anglers can download and display them on a smart phone or mobile device. Information Center staff also can sell other licenses and answer general questions. Resident military veterans or active duty members receive a 50 percent discount off their fishing license and stamps. Children under the age of 12 do not need a license to fish, and anglers age 70 and older qualify for a free license. Resident active and military veterans qualify for free or discounted licenses. Please consult the Fishing Rules and Information Booklet at www.wildlife.state.nm.us for more information. 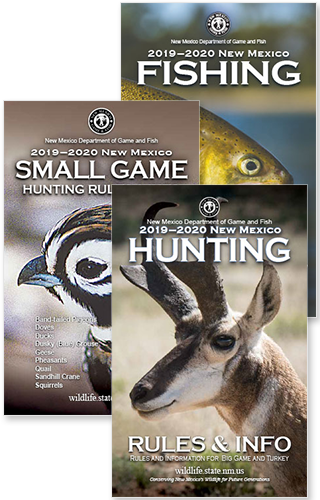 Printed versions are available at New Mexico Department of Game and Fish area offices and soon will be at license vendors statewide. For weekly angling and stocking reports please visit www.wildlife.state.nm.us.